You may have seen a video I posted on Home Studio Corner a couple of weeks ago. In the video, I was mixing a song with two bass tracks – a DI and an amp track, both of the same performance. When I played the two tracks together, the bass sounded a bit thin. By themselves each track sounded okay. But together? Not so great. Usually this means there’s some sort of polarity or phase issue. So, I zoomed in and looked at the waveforms. I could see that the amp signal was a little bit behind the DI signal. It was only a slight difference, one right after the other, but it was there. So I nudged one of the tracks until the two lined up better (not perfect, but closer in line). And guess what happened? Everything sounds full and awesome again. Well, somebody apparently thinks I was wrong for teaching this. He left a comment (both on my site and on YouTube), saying that there was no way there would be a timing difference between the two tracks, and that I could have fixed this by simply flipping the polarity on one of the tracks. And you know what? It worked as well. It took a thin-sounding bass sound and made it fuller. Granted, my approach made it sound full, too. Well…if I’m giving bad advice, and that advice helps you get a better bass sound (and better mixes), then I reckon I’m just going to have to continue giving bad advice. P.S. I recorded a followup video where I tried both approaches. Check it out here. P.P.S. 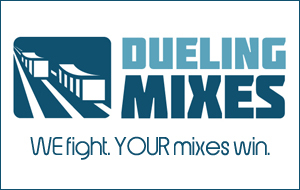 The song I used in the videos is actually last month’s song we mixed over at Dueling Mixes. A little birdie told me you can still download the tracks if you join soon.